Incredible result. Well done, Dr. Hasson! The hairline is perfectly natural-looking. This gentleman must be thrilled with his results. Bravo, Dr. Konior! I was just about to point out the exact same thing. Dr. Erdogan has stated his belief that the homogeneity between donor and recipient achieved through larger FUE sessions can be beneficial to the final aesthetic. In this particular case, where the patient's level of hair loss was so extensive, I believe that benefit is clearly evident in the final outcome. Very natural looking results considering the extent of the hair loss. I'm sure the patient is thrilled! This is a very impressive result. Great work camouflaging the strip scar, Dr. Cooley. Good luck with your forthcoming surgery, vermej. I look forward to following your post-surgical progress. This is one of, if not the, best result I have seen. Thank you for documenting your journey so thoroughly, Matt. If I decide to go the surgical route in the future Dr. Konior will be at the top of my wish list. Hi David and greatjob, Thank you so much for your replies and for the friendly welcome. I have definitely come to the realisation that the most effective way of preserving my native hair may be to give Propecia a try. I received the following response from Joseph Tillman at Hasson & Wong: "Thank you for your interest in Hasson & Wong. Based on your stated progression of loss it is recommended that you find a solution to stabilize your loss before you undertake any surgical remedies. It is highly recommended that you begin using Propecia to halt this loss as it most likely will also reverse the loss to at least a small degree, mostly throughout the top of your scalp. You will have to take the medication for approximately one year to see any benefits of reversal but keep in mind that any medication such as Propecia or Rogaine is only a treatment and not a cure. Once you cease their use your loss is guaranteed to continue. Once your loss is stabilized or it has turned around in any way we can discuss surgical options should you so wish." I sent a follow-up message to Joe asking for advice on acquiring a prescription for Propecia, although I'm not sure if he received it as he did not respond. I recently relocated from the UK to Canada, and I'm not too far from Ottawa so I could potentially schedule a consultation with Dr. Rahal. Would you guys recommend such a visit? If I can stabilise my hair loss I would consider a surgical procedure in the future to restore some of my hair at the hairline and perhaps add some density throughout. I will definitely be active on the forums and update my profile as my journey progresses. Hi everyone I have been researching male pattern baldness since 2010 after noticing the first signs of recession at the corners of my hairline. I have been a long-time lurker on sites such as the hair transplant network, which I have found to be a source of reassurance, guidance and hope during the trials and tribulations of my hair loss journey. Although dealing with hair loss can be psychologically very difficult, I feel blessed to have ethical resources such as this community available to inform my decisions when combating my hair loss. A little about my journey so far: My hair loss began in early- to mid-2010 with slight recession at the corners of my hairline. I was going through the most stressful period of my life to date, which may have been a factor in triggering my balding. I remember shedding a lot of hair in the shower during this period. My loss was relatively minor and stable for the next year and a half, during which time I was somewhere between denial that the hairloss was happening, to hoping it would just stop of its own accord. In August 2011 I suffered the first signs of loss at the centre of my hairline. Over the next three to four months I began to see the first signs of thinning at the crown and in the mid-scalp area. I began using 10% minoxidil liquid in January 2012, and quickly switched to Rogaine foam for its ease of use. I discontinued use after around four months, as I grew impatient waiting for signs of positive results. By late mid-2012 my hair had improved in the crown and mid-scalp regions, and the loss in my hairline seemed to have stabilised. I was unsure whether to attribute this to Rogaine or to a reduction in stress levels. 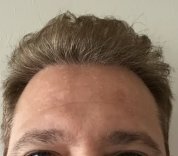 By November 2012 I had noticed a deterioration in my crown again, and began using Rogaine foam in the hope of combating this. Between January and July 2013, however, there was an acceleration in the thinning throughout my scalp, from the hairline to the crown. Earlier today I finally bit the bullet and sent an online consultation request to Hasson & Wong for guidance on the next step of my journey. I am strongly considering trying non-surgical treatments like Propecia, although I have read so many horror stories online that I am very wary. The conflicting information all over the net is one of the reasons I have procrastinated for the past two years rather than reaching out for help and advice; I simply did not know who to believe! Any comments or advice from members of this community would be greatly appreciated, particularly the approved physicians.